This year’s Detroit Auto Show had a big focus on trucks and autonomous crossover concepts, and most of the big stuff was out of the way before the show even officially began. That left the other companies some space to show up with some surprises. Unfortunately, those surprises were not a mid-engine Corvette, nor a Toyota Supra, nor anything else that would probably be pretty cool. But Hyundai did have plenty of breathing room to debut the new Veloster and its performance variant, the N. But the company also surprised us with a fun little joke. I almost never think about Hyundai, but I must have visited the Hyundai stand at least four times in my two days on the show floor in Detroit. At first I was genuinely curious and excited for the Veloster N, and then I saw the purple car with side-pipes and flames off to the side. Before the Hyundai reveal event, me and Andrew Collins were looking at the three cars under covers trying to guess which was which. One was probably a normal Veloster, the second a Veloster Turbo, and the third, with its obvious hood scoop and massive wing bulging under the cover, must be the Veloster N or some sort of Veloster race car. It was neither. It was a purple Veloster Turbo set to feature in the upcoming Marvel movie Ant Man And The Wasp, designed to look like a blown-up Hot Wheels car, or something. It was sitting on massive BF Goodrich tires with Good Year stickers covering the logos, on chrome wheels, with a massive chromed rear spoiler, a hastily glued-on hood scoop, convenience store port holes accentuating body-length flame decals, and massive quad side-pipe exhausts that were bolted straight into the bodywork. It was magnificent. It’s almost surprising for an automaker to risk distracting from its big reveals with something so inoffensively vulgar taking up a quarter of the stand, but a tongue-in-cheek joke car like the Ant Man Veloster was something no other automaker brought (at least intentionally). The only problem was that it was locked, probably so that you wouldn’t try to open the funny third door in the back and rip off the side pipes. Kudos to Hyundai for having a little bit of fun in an otherwise super serious show, and for reminding me that I still need to see the first Ant Man. 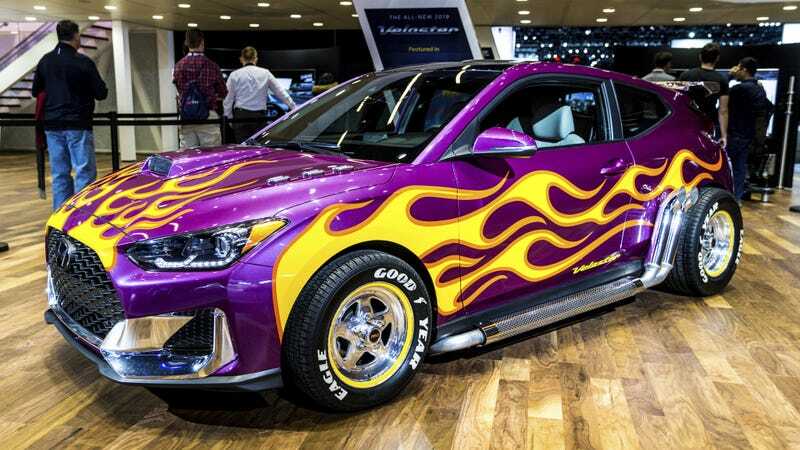 What’s even funnier is there’s almost no context for the new movie, just that there will be a purple Veloster with flames at some point. I love it.